For much of the last century, large, predominantly US corporations used public relations to demonstrate that their missions resonated with dominant societal values. Through the construction and conveyance of the "corporate persona", they aimed to convince citizens that they share common aspirations - and moreover that their corporate "soul" works as a beneficent force in society. Through examining key examples from the last 80 years, this book argues that PR, through the corporate persona, works to create a sense of shared reality between the corporation and the average citizen. This has been instrumental in conveying, across generations, that the corporation is an affinitive corporate persona - a fellow companion in the journey of life. The construct is obviously ripe for manipulation, and the role of PR in creating and promoting the corporate persona in order to align corporations and stakeholders is potentially problematic. From wage inequality to climate change, preserving the corporate status quo may be negative. This original and thought-provoking book not only critically analyses how PR and its role in the corporate persona works to solidify power, but also how that power might be used to further goals shared by the corporation and the individual. 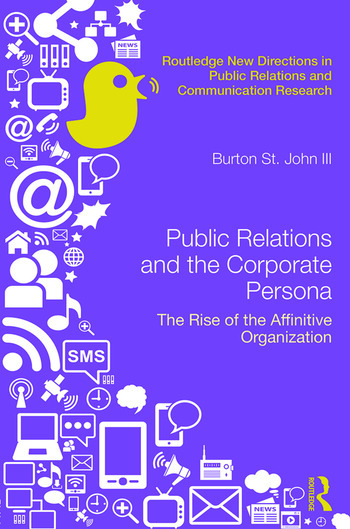 Scholars and advanced students of public relations, organizational communications and communication studies will find this book a challenging and illuminating read. 10 Where to with the corporate persona? Burton St. John III is Professor in the Department of Communication at Old Dominion University, USA.